So the ladder I got this weekend, I cut it in half. Cringe! It was hard to do, so beautiful it was. But the two halves are perfectly at home in new places. I sanded them and wiped them down and put on a sealer. 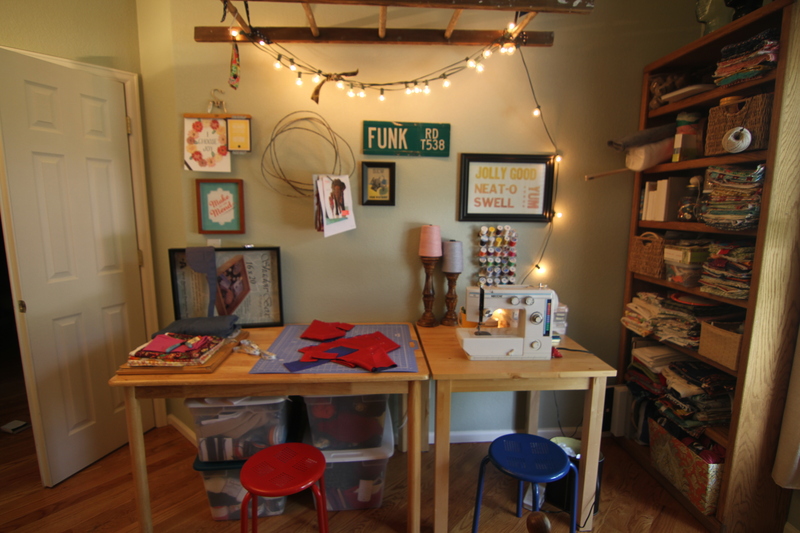 I hung one above my worktable, and I thought I’d show you this space. Because it is my favorite. 27 square feet of lovely color and inspired order that makes creating easy. The room is on the main floor right by the living room and 15 feet from the kitchen. So convenient. 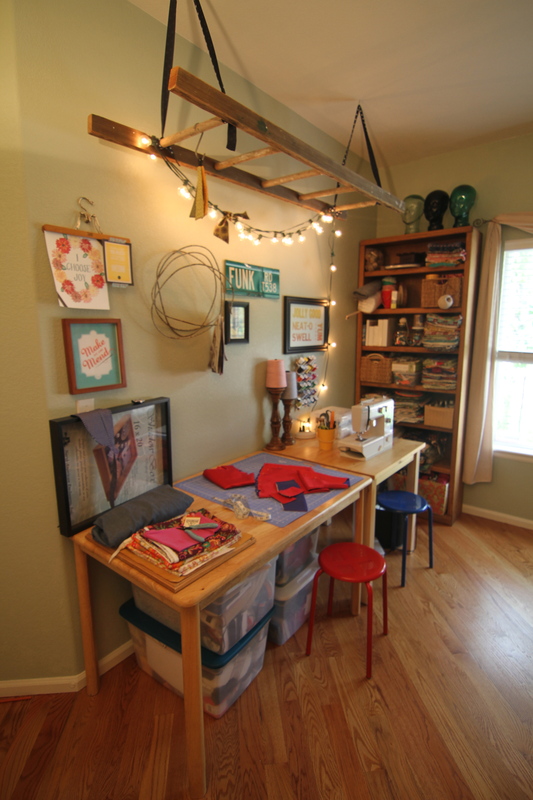 I always work to place the making space and the kids play and school room right in the main living area. Neither of them works well in the basement or a bedroom. Soon the ladder will be hung with half done projects and inspiration ideas. That is a cape in progress. And lest you think all is perfect, here is the other two-thirds of the room. 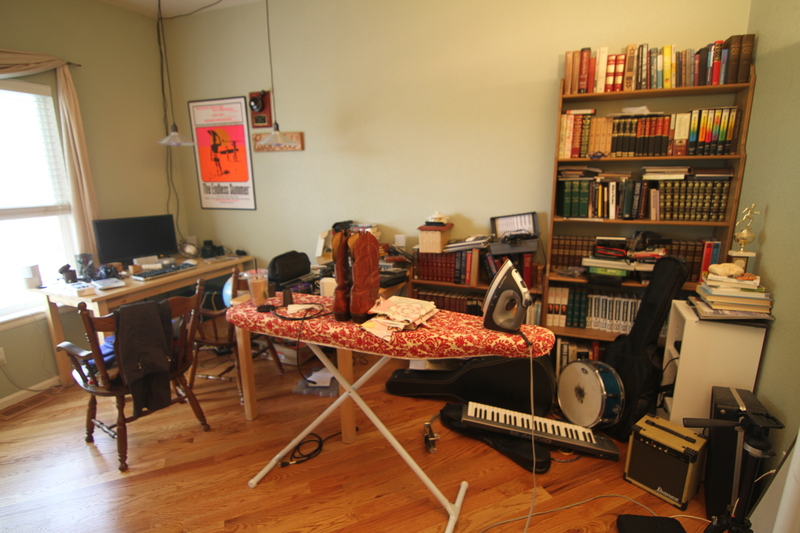 Theology library, music room, electronic and computer workstation, waiting to be craigslisted repository, and ironing spot. I’m working on that blank wall. Do you see that soup crock on a plaque? My husband is a really good cook and won that chili award. His interests are so varied. He needs a wall of memories and appreciations. I love it! So inspirational, indeed! That looks great ! I have been searching for a couple of ladders for the past year, wherever did you get yours? I found it on craigslist. I had been looking 18 months and someone decided to sell the one they were holding on their apartment building roof. What will you do with them? You are currently reading The workspace- and ladder chandelier at whatsarahfound.